On Friday, January 26, January, Ryan Cassell, Director of Admission at the University of the South, attended morning Chapel at St. Andrew's-Sewanee School to deliver "big envelopes" of Early Action admission to 14 of the 48 members of the SAS senior class. Early Action allows students to apply to the college early and receive their admission decisions in mid-February. It is Sewanee's most popular admission option. That morning, SAS Director of College Counseling also announced admission and merit scholarship awards for seniors admitted to Rochester Institute of Technology, Wooster College, Purdue University, Ohio State University, University of Southern California, Aberystwyth University (Wales), High Point University, DePauw University, Roanoke College, Wingate University, Maryville College, and Centre College. SAS seniors have been receiving admission decisions since the very beginning of the school year. The college admission process usually concludes in late March. Last year, the 44 members of the SAS Class of 2017 received 150 acceptances to 102 different colleges and universities and enrolled in enrolled in 29 different schools across the country, from Wellesley College in Boston to Lewis and Clark College in Portland, Oregon and all points in between. Members of the class were offered over $3.8 million in merit awards, including Presidential Scholar at Boston University, Marquis Scholar at Lafayette College, Charger Distinction Scholarship (full tuition) at UA-Huntsville, Chancellor's Scholarship at Agnes Scott, Presidential Scholarship at Stetson, and the Dean's Scholarship at Maryville. Three students were named Bonner Scholars. 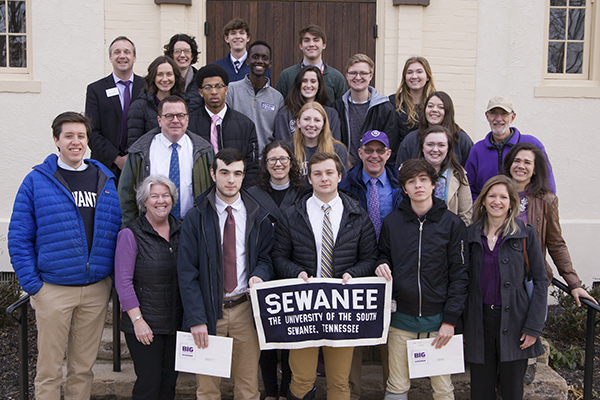 The University of the South Director of College Admission Ryan Cassell attended Chapel at St. Andrew's-Sewanee School on January 26 to deliver Early Admission decisions to 14 members of the SAS Class of 2018. Twelve of those students are pictured here with Sewanee alumni on the SAS faculty and staff.